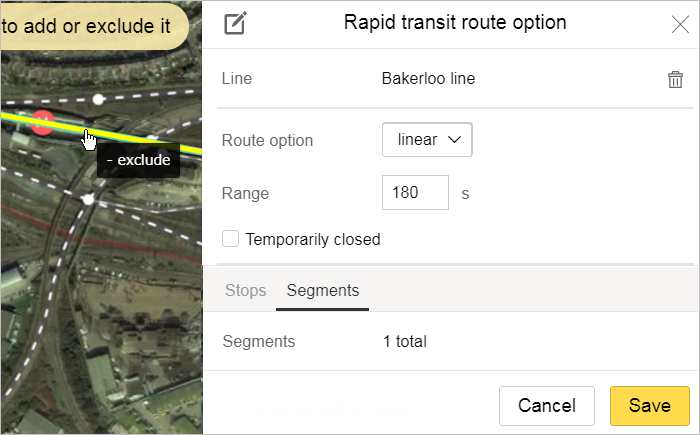 Not all YME users can create rapid transit route options or add attributes to them. 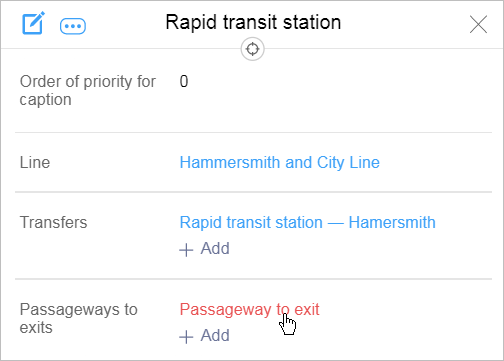 To add information about transport lines used to build routes on public transport routes, use items of the route, transfer (between rapid transit stations) and passageways to exits (or station entrances) types. Techniques for drawing and editing composite linear items such as rapid transit routes (like rivers and roads) are described in section 2.6.2. Composite linear items. Every route includes the stops that the particular vehicle makes, along with the time intervals between vehicle arrivals, waiting time, and the time the vehicle spends traveling between stations. Generally, a rapid transit route will follow one rapid transit line, but it may include sections that belong to other lines. For example, a metro train that goes from the Park Kultury station in Nizhniy Novgorod heads in the direction of either the Burevestnik and Gorkovskaya stations, which are on different metro lines. Every route has several route options. Even the simplest routes include two options (i.e. the option that runs in each direction), so for each rapid transit line that goes in both directions, you should create at least two route options (from A to B and from B to A). Enter the time intervals between vehicle arrivals, waiting time, and the time the vehicle spends traveling between stations in seconds and use local time. 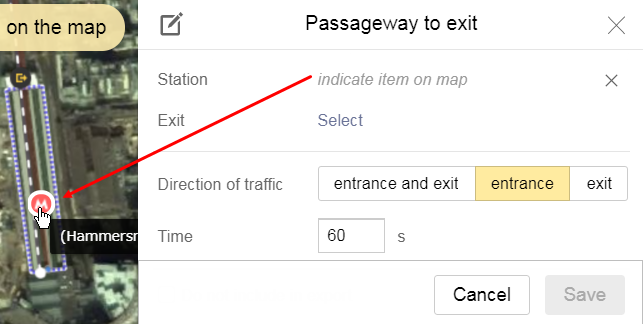 You can not create a route option without indicating the time interval between vehicle arrivals, time the vehicle spends traveling between stations, and waiting time at stations. Create route options based on sections of rapid transit lines and stations that were created earlier (i.e. 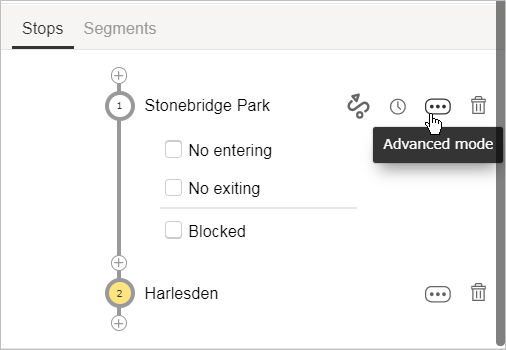 you can add subsequent sections to a route option). The Rapid transit route option panel opens. In the Route type field, select the route type: Linear or Ring. Only route options where the first and last stations are the same are considered circular routes. Route options where the first and last stations are different are linear routes (even if the route resembles a circle). In the Interval field, enter the time interval between vehicle arrivals at the stop (in seconds). En route — enter the time en route between the highlighted station and the following one (in seconds). No exiting — check the box if passengers can not exit at the station you selected. 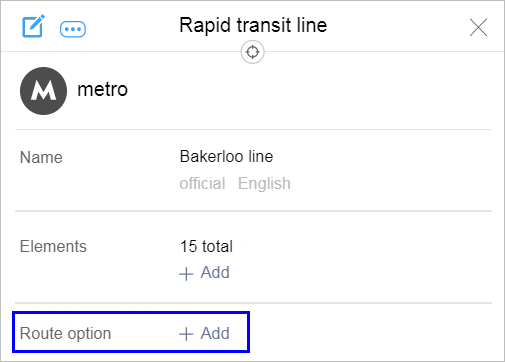 Go to the Sections tab and enter the list of rapid transit line sections that are included in the route option. 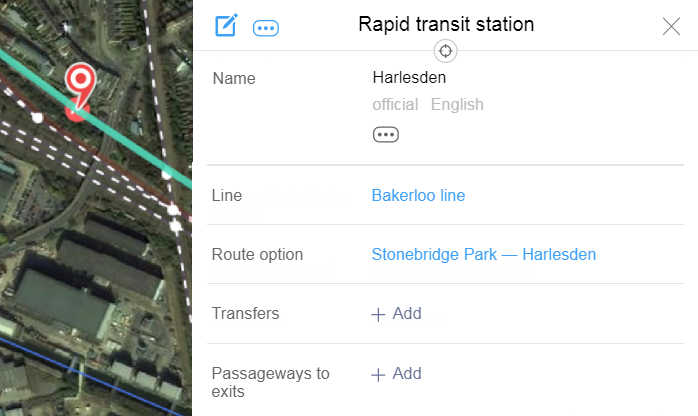 To add a section of rapid transit line to the route option click on it. 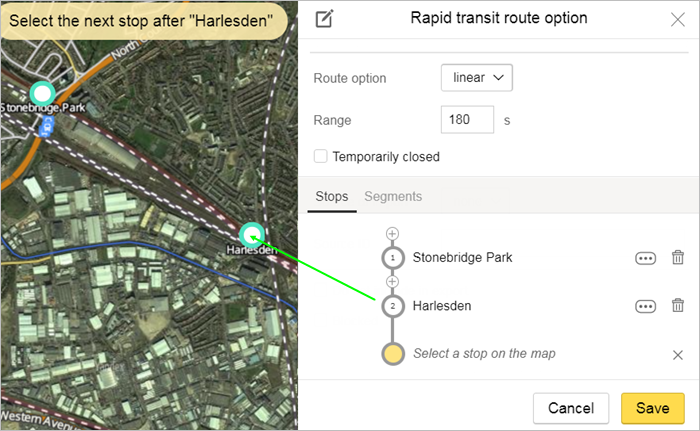 Click again to exclude it from the route option. The route name will automatically be that of the first or last stop. 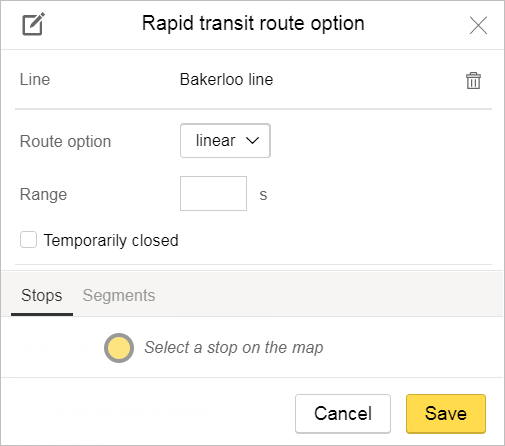 The name displays in the Route options field of the Rapid transit line panel as a link that opens the route option editing panel. Only create a Transfer item between stations that have a separate crossing from one station to another (i.e. a way to transfer without exiting the rapid transit system and without going through other rapid transit stations). You can not create a transfer without indicating the time it takes to transit between stations. Create transfers based on rapid transit stations that were created earlier. 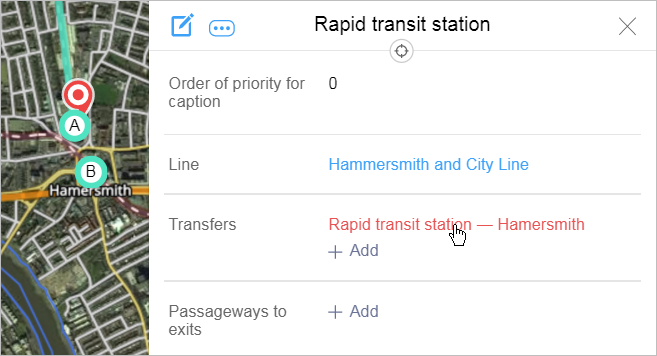 If there are several transfer options between that pair of stations that do not differ by the direction of the transfer, then create a single Transferitem and enter the time it takes to transfer between stations for the fastest available option. In the Time field, enter the time it takes to transfer (in seconds). In the One way (from A to B) field — check the box if you can only transfer in one direction (A → B). Click Save to finish creating the transfer. Only create a Passageway to exit item for metro, monorail, rapid bus, or light rail transport stations (including light metro or rapid tram stations). Don't create passageways to exits for rope roads and funiculars. Create passageways to exits based on rapid transit stations and exits that were created earlier. Duplicating passageways to exits is not permitted. Every pair of “station exits” should only have one Passageway to the exit. Open the editing panel for a rapid transit station and click Add in the Passageways to exits field. In the Time field, enter the time it takes to exit onto the street from the center of the station (in seconds). In the Direction of traffic field, click the button that corresponds to the direction of traffic (only entrance to station, only exit from station, or in both directions). Click Save to finish creating the passageway.